It was bound to happen eventually and on Friday it did. The mighty UConn women’s basketball team finally lost. After an historic 111 win streak, UConn lost to Mississippi State in an exciting buzzer beater sending Mississippi State to the Finals. On Sunday, South Carolina ended Missisissippi State’s euphoria with a big 67-55 win to bring home the NCAA Title. 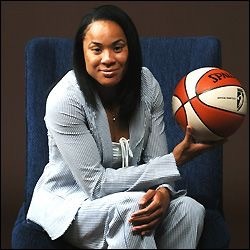 All eyes were on South Carolina’s coach Dawn Staley as the NCAA Title eluded her when she was a college player. It was also South Carolina’s first NCAA Title. Congrats. In the men’s Final Four tourney, #1 Gonzaga beat South Carolina on Saturday and #1 North Carolina beat Oregon. The two #1’s will face each other Monday night in the NCAA Finals. This is Gonzaga’s first appearance ever in a National Title Game. The excitement starts at 9:20 pm tonight.